There is really nothing more important than good quality business grade web hosting and email hosting, when you get a new website designed. 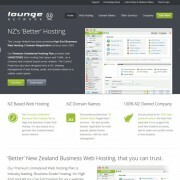 Through our Wellington Web Hosting division, the Lounge Network, we offer some of the best and most reliable web hosting services available in New Zealand. We host all of our clients new websites on it. Our web hosting service includes domain based email accounts for no additional fees, so you can have any email address you want, ending in your domain name eg. anyname@yourdomain.co.nz. Our web hosting service also isn’t just restricted to our own web design clients. We also have web designers and stand alone web hosting cleints all over New Zealand using our web hosting service, including many clients in Auckland , Hamilton, Wellington, Christchurch and Dunedin.